It’s back-to-school time, and that means it’s also the beginning of high school sports and the need for sports physicals. 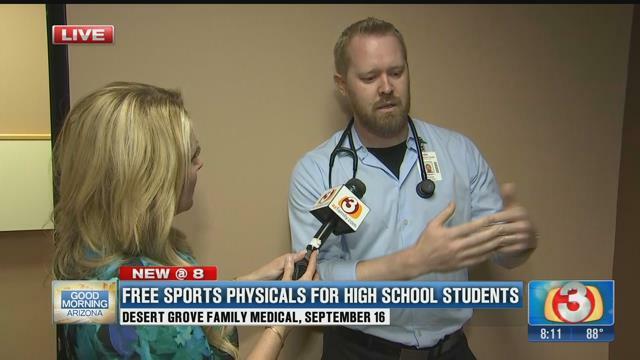 Mountain Vista Medical Center & Desert Grove Family Medical are teaming up to offer free sports physicals for east Valley high school students Sat. Sept. 16th, including incoming freshmen. The standard Arizona Interscholastic Association (AIA) sports physical remains valid for high school athletics during the entire 2017-18 school year. Saturday, Sept. 16, from 8 a.m. to 10 a.m.
Mountain Vista Medical Center & Desert Grove Family Medical are offering FREE sports physicals, regardless of whether a student has insurance. Register: Appointments must be scheduled in advance. To schedule a free sports physical, call (480) 834-7546.